OAKLAND -- After getting recalled from Triple-A in the morning and tossing seven innings of one-hit ball in the A's 1-0 win over the Cubs in the afternoon, you'd think that Dan Straily would be the A's Fourth of July MVP. "Derek Norris is the hero of the day back there," Straily deflected. "Without him in the lineup today, we don't win that game." It's true; Norris played turned in a complete performance, mixing stout defense with quality at-bats, aggressive baserunning and a wisely-called game. 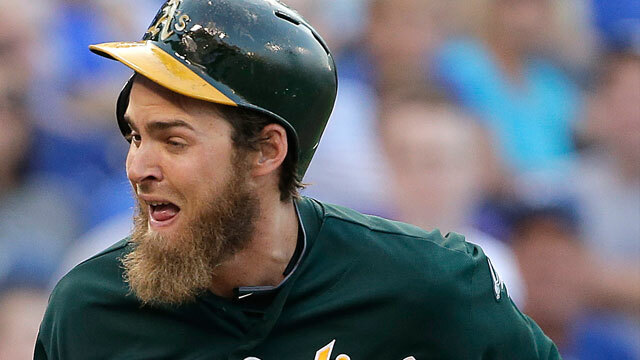 Norris was forefront in the A's defensive fourth inning. He applied the tag that kept the Cubs off the board when Yoenis Cespedes gunned down Starlin Castro at the plate, and two pitches later he cut down Alfonso Soriano attempting to steal. "That's the ballgame right there," Straily said of Cespedes' throw. "I was pretty jacked up. I think I had the best view in the ballpark. I'm not sure if he saw my fist pump, but I was pretty excited about it." "Anywhere the runner is," Norris added. "I know he's got a shot. He's got that good of an arm. He put it right on the button. Any time you can throw a guy out from the outfield, it's going to fire the guys up." The Norris Express also scored the game's only run when he read ball-in-dirt in the seventh inning and came chugging down the line. "I saw it go between his legs," Norris explained simply. "Just looking for any chance to get home. I tried to kick it into another gear, just in case it bounced right back to him." Norris' extra gear was enough. He's 5-for-9 (.555) over his last four games, but he deserves the most credit for his handling of the A's young righty, making his first big league start since June 22. "I got to the ballpark a little early today because I didn't know who was right-handed and who was left-handed," Straily acknowledged after using just 87 pitches over seven shutout innings. "D-No said, 'Throw whatever I call.' He's done his homework and knows the hitters a lot better than I do. "I guess you could say we were on the same page, which was his page all day. And it was a good one." Straily, now 4-0 with a 3.02 ERA over his last eight starts, said he only successfully shook off his catcher one time, in the first inning. After that, whenever Straily shook, Norris simply put down the same sign and set up his target. "Part of that is the relationship we have, knowing each other," Straily said, the trust between he and his catcher palpable as they stood across the locker room. If Norris didn't give the A's a lead in the seventh, Straily would have gone back out to pitch the ninth. "I'd rather take us scoring, especially with our bullpen," Straily said. Ryan Cook went 1-2-3 in the eighth and Grant Balfour overcame a single and an error to strand the tying and go-ahead runs while recording his 39th consecutive save for the A's -- one shy of Dennis Eckersley's franchise record. While Straily was appreciative of his backstop, Norris was proud of his pitcher. "It looked like he wanted to prove something," Norris said. "He looked like he wanted to make a statement, that he deserves to be here. He pitched with conviction." The battery of Straily and Norris -- a pair of 24-year olds -- could be playing the hero in Oakland for years to come.